Gillian Armour drapes Clover Tejada in colored fabric to find the best match. In this image-conscious world, with camera phones lurking in every corner, everybody could use a little help now and then, and Leomana Cosmetics has won over many a fan, both male and female, although the former probably wouldn't want it known they're using makeup. Some day, real men will be able to 'fess up, but for now there's no shortage of women who will vouch for Leomana's custom-blended mineral powders that, with a light touch, look more like flawless skin than makeup. Lori LeCuyer-Clark, for one, who no one would guess had any skin problems, said, "I have rosacea and broken capillaries, enlarged pores -- I think that happens to all of us after 40 -- but what I like about Leomana is that these minerals don't sit in your pores or in your lines. It can cover broken capillaries. It's the best thing I have found for getting even skin tones." Coverage is achieved without the cakiness of makeup brands that attempt to bury problems in a thick, muddy layer of foundation that looks far from natural. 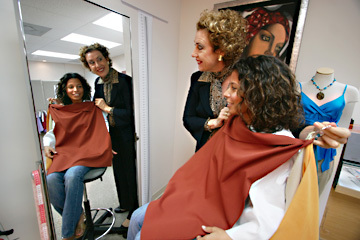 Above, Armour holds a fan of warm-toned hair colors, to find the fit for Tejada's skin tones. 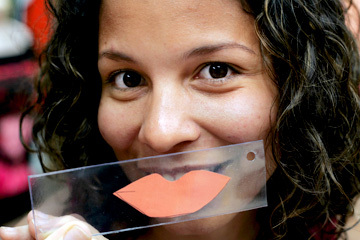 Below: Lip color choices on sheets of acrylic give Tejada a good idea of how a certain shade of lipstick will suit her skin tones. "Our goal is to enhance your beauty and not make you look like a different person," said Jocelyn Gottesman, co-owner of Leomana with Maureen Scanlan-Freitas. The two met while working at the makeup counters at Liberty House seven years ago. That's where they learned to create custom liquid foundations for customers, but found the palette limiting and, Gottesman said, "It would be OK when customers put it on, but later, when they went home, they noticed the colors would change, and we found that to be true of many lines." The two friends started Leomana in 2001, and business has grown slowly by word of mouth and in-home parties to the point that they were able to open their studio last year. The studio is open by appointment only to give clients personalized service. The mineral powder runs $35, including consultation, and a 1-ounce blend lasts about three months. Personal recipes are then kept on file so individuals can continue to receive their blend, even if they move away. Maureen Scanlan-Freitas, left, and Jocelyn Gottesman, co-owners of Leomana Cosmetics, offer custom foundations for women who visit their Kapiolani Boulevard salon. 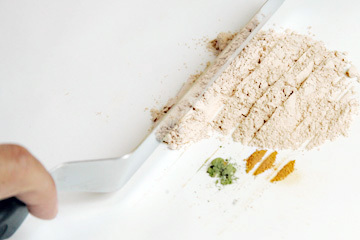 Scanlan-Freitas demonstrates their custom work by measuring out spoonfuls of flesh-toned minerals with a few small dots the color of green tea and curry powders, suitable for Asian skin tones. Their arsenal also includes vivid blue and deep purple powders for Caucasian skin tones. The custom color touches appear to breathe warmth and life into skin. The problem with mass-market brands is they have limited color palettes, often with only two or three colors suitable for the spectrum of Asian skin, for example, which tends to look too ashy, pink or gray with commercial formulations. "At first our focus was on women of color, but then we saw there were people with skin conditions who needed it just as much," said Gottesman. Leomana also offers eye and cheek colors for everyday wear. "They're not trendy colors," Gottesman said. "They're more like colors a working woman could wear on a daily basis. It's very mom-friendly and easy to use. If women want a more dramatic look, they could add a darker color." As a mother of two versed in knowing what women want, Scanlan set up a children's corner in the office to make it easy for moms to drop in with kids in tow. Leomana's studio is also open to private parties for a minimum of 10 people paying $10 each. "They bring in their own food, and we call in women two at a time to do makeovers and take before-and-after photos," Gottesman said. "It's great for girls'-night-out parties, just an excuse for women to get out of the house." Spots of mineral powder color prevent skin from looking too ashy, gray or pink, for more natural coverage. Leomana Cosmetics is at 1311 Kapiolani Blvd., Suite 205 (at Pensacola Street, across from Sleepland), open by appointment Mondays to Saturdays only. Call 591-6595.